NEW YORK, NY, April 18, 2016 – MCW, a New York-based non-profit organization dedicated to addressing communities’ pressing needs by empowering current leaders and readying leaders of tomorrow, announced today the appointment of Nitya Ramanathan as Coordinator of the Young Leaders Program. 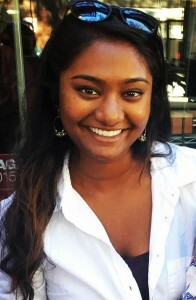 As the new coordinator of the Young Leaders Program, Nitya will be responsible for supporting the logistics of the program’s annual retreat, leading and creating outreach efforts for alumni, and working with an international group of youth mentors and leaders, all while working with the MCW Young Leaders Program committee. Nitya first joined the MCW team in October 2015 as an intern, working closely with Regina as the Young Leaders Program underwent a major restructuring from a one-week summer experience to a year-long program. During her time as an intern, Nitya helped with the application process and review of applicants to the 2016 Alumni Ventures Fund and the 2016 Young Leaders Program, and greatly increased MCW’s online presence among the alumni network. She also oversaw the launch of MCW Stories, a blog with personal testimonies of social injustices, written by YLP Alumni, MCW Friends and Team Members, and others who share the MCW mission. Nitya is a graduate of the University of Southern California where she earned her B.A. in International Relations with a double minor in Human Rights and Resistance to Genocide. Her academic focus was in post-conflict reconstruction and throughout university she traveled to Sri Lanka, Rwanda, and Northern Ireland to study the issues of justice, education, and women’s rights. Prior to joining MCW, Nitya worked as a Program Consultant at the Kupferberg Holocaust Resource Center and Archives, and as a Group Leader at Harlem RBI.